So my haul includes 1 36 count playtex tampons, 118 ct box of playtex tampons, 1 box of Nips, travel size Children’s advil, 1 large roll of charmin toliet paper, Dove for Men body wash, 1.25 liter of diet coke, 1 bottle of poweade, and a glade plug in warmer. Playtex 36 count and Playtex 18 count. 36 count is on sale for $7.99 (regularly $8.99) with $4 in EB’s back, the 18 ct was $5.49. In addition I had 2 coupons. 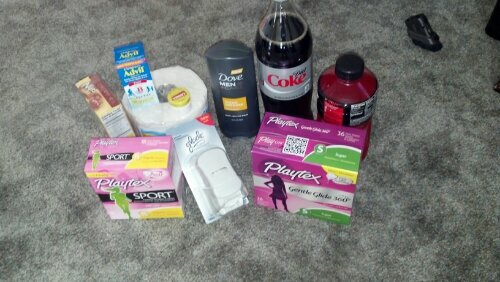 $3.00 from CVS and a Buy 1 36 count get 1 18 ct for free. Nips (reg. $1.27) $0.88 with $0.88 back in ebs, powerade (reg 1.49) $1 with $1 back in EBs, 1.25 L of Coke $0.99 with $0.99 back in EBs, childrens advil 1oz, (reg $2.67) $2.37, plus $1.250 off and $2.37 back in EBs, carmx (reg $1.67) $1.00 plus $0.30 off coupon and $1 ebs, charmin basic roll (reg $1.49) $0.99 plu s $0.99 back in EBs, glade oil plug in (reg 2.49) $1.25 with $1.25 in ebs. Total savings of $5.66 and savings of about 86%. I still have left over $4.61 in EBs, which I could have used to buy several more items that were free after EB’s, but I did not need those items so bypassed. My CVS did not carry the command hook that was on sale (which I had a $1.00 coupon making it free with a $1.00 eb back). So I paid $9.25, saved $23.63 (total product $32.88) savings of 72%, gained $5.00 from savings star and an additional $4.61 ebs to use in a future transaction. My deals would have been better if my toner had yet arrived to print off a couple more coupons. Looking forward to the black friday ad!